North Torrance Little League (NTLL) is responsible for the all the costs associated with maintaining the facility, including mowing, fertilizing, irrigation & irrigation repair, pest control, weed control, electricity, water, telephone & garbage. In addition, all the improvements, including fields, fences, dugouts, backstops, concession stand, toilets, maintenance building, and lighting, have all been paid for, constructed, and maintained by NTLL. Because of the substantial investment in these facilities, it is imperative that all players, parents, managers, coaches & board members make every effort to continue to keep the buildings and grounds in good operating condition. This includes making sure that all fields are properly prepared prior to and upon completion of every game. It is the responsibility of the home team to insure the infield is set up (bases installed, field raked/dragged, watered and properly lined) prior to each game. It is the visiting team's responsibility to insure the infield is torn down (bases removed, field raked/dragged and watered). Each team is responsible for cleaning, sweeping, and removing the trash to the dumpsters and replacing the trash can liners for the bleachers and dugouts occupied by their team. This video shows the proper way to rake the infield dirt. 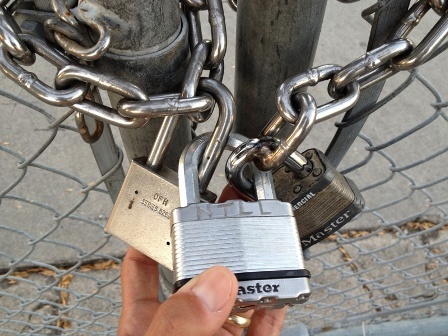 The locks must be secured in a "lock to lock to lock" fashion as shown in the photo. If you do not lock the gates properly, the School has no choice but to cut off the baseball/softball locks to gain access to their parking lot.